Growing up I spent a lot of time with my grandparents. It was not unusual for me to spend more weekends with them than at home in a month. I would go over Friday after school and stay until church time on Sunday. Before I would come out for the weekend, my Mamaw would ask me what I want for dinner. She is an excellent cook and I love eating her food! However, my most requested meal didn't require her to really 'cook.' But I loved it and asked for it all the time. I asked for fondue. 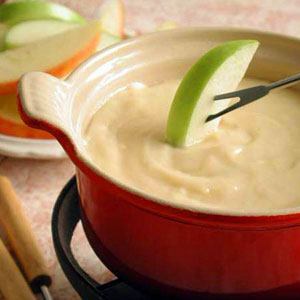 What we call fondue is cheese and fruit. So simple, yet so good. I am not a big meat eater, but we started adding slices of ham or turkey to dip in the cheese as well. Probably because my Papa is such a strong guy and needs his meat. We like cheese whiz cheese (I know not a healthy option, but it's what we like, you can use your favorite cheese for melting). Pour into a pan and heat on the stove, or if you are more of a microwave kinda gal, pour into a microwave safe bowl and heat up. While it is heating, slice apples, oranges, and bananas and pick grapes. Then when done, simply dip your fruit bites into the cheese. This meal would not fill my husband up for a dinner so the kids and I have had it for lunch. It would also make a great snack, especially with football season now started! I am so glad you liked the fondue and even more so that the grandkids like it. We haven't had this in a really long time, I think we need to get some cheese and fruits and have it, even the sliced ham or beef. Blessings to you, Jenifer and love you so much.